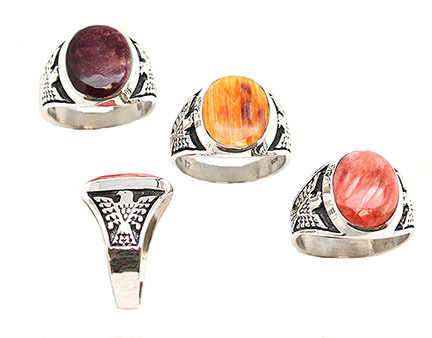 This sterling silver thunderbird cast men's ring is inlaid with an oval spiney oytser stone. This ring measures 3/4" long by just over 1/2" wide on top. Native handcrafted by Navajo Artist Ella Cowboy. Colors of stones available in red, purple or orange. Choose color(s) and size(s) when ordering. None available in purple spiney like pictured.